Add rich, decadent accents to your home with Exposures' luxury picture frames. Choose from our unforgettable Windsor frame, any of our pewter picture frames or add classic beauty with our sterling silver frames. 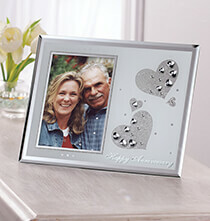 Showcase the memories for years to come with any of our beautiful photo frames, offered in horizontal or vertical displays.